FYI, I'm looking to do the upgrade. I have a Summit Multispark box, so I contacted Summit. They told me a filter would not be required. Probably because their box is digital, unlike all the other makes that are analog. To Starter Solenoid or To Black/Orange Post? send the power from the 3g, via the black/orange stripe main wire to the starter relay ///? I have it all installed, basically just like the diagram. does anyone who has done this modification still have a working "factory" ammeter gauge? to truly have your ammeter working the charge seems to run thru one circuit that has a shunt on it, while the battery feeds a different circuit thru the starter relay. the mod for using the 3g alternator instructs to attach the larger 3g style cable t the starter relay and almost completely disables the ammeter. if you run a 10 gauge wire from the relay to the original connection the ammeter moves, but calibration would have to be done by trial and error with various shunt configurations, and there is still that fire issue. what i decided to do was to attach the alternator to the starter relay terminal as directed, and reverse the wires on the back of the ammeter. for some reason this shows the amount of increased charge coming out of the alternator? Ok....scouted the bone yard this weekend and found a bright and shinny reman alternator on 96 Taurus and the perfect wire harness off a crown vic. It is long enough with the factory fuse links. Yanked it all, test fit it all, and had alternator tested at AZ. All seemed perfect. Worked on swapping out the pulleys and the crap began. The old v belt pulley rubs the housing and the new shaft is a little short for a full nut engagement. A thin shim behind the pulley would work but I need a pulley that has a recess for the nut. Checked pulley alignment on new alternator vs old and it will be fine. Hoping it will be a simple as finding a different pulley. Has anybody had this problem? That would be cool. Any help would be appreciated. I have a reman 1G and the pulley is a solid machined piece without a recess for the nut. Was thinking that maybe other 1G pulleys are different. I hope you have a little better luck than I am currently having. Small problem but I was excited on how easy things were going. Thanks 5.0........I might have to take you up on that. Papa, I have some pics of two different 1G pulleys that will work on a 3G alt. 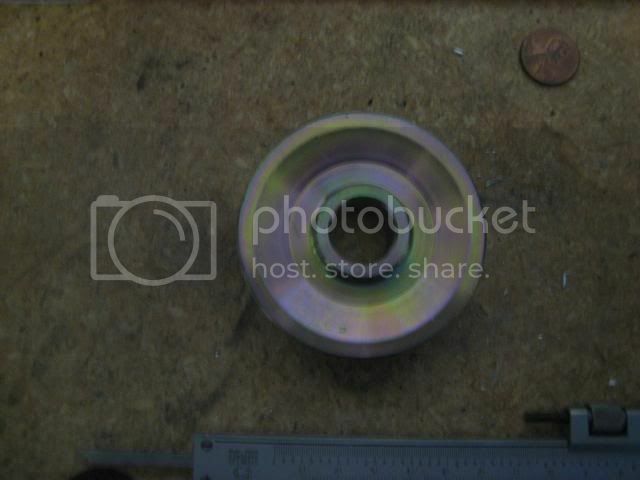 One pulley has Ford part# C5AF-10A-352-K, here are a few pics of it. Pulley installed without lock washer to engage all the shaft threads(I would use locktite and be fine with it). You could also lathe the boss area on the face of the pulley, flush with the body of the pulley to install a lock washer. 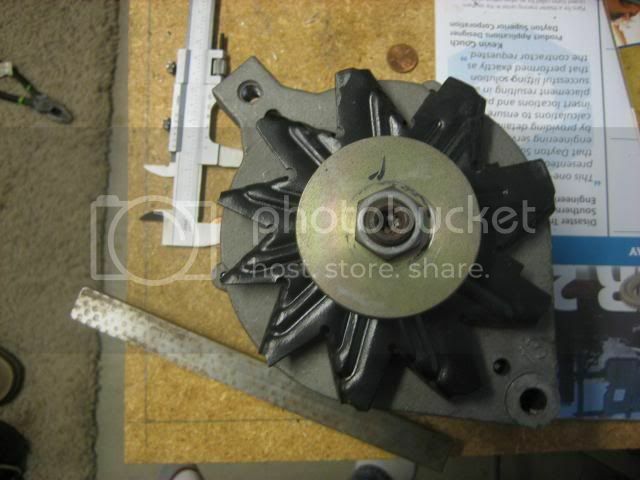 Here are pics of the second 1G alternator pulley I have. I believe it is a Ford factory pulley, but I cannot find part #'s due to painting pulley with epoxy. Face of pulley and rear of pulley are identical, pulley sheave runs the centerline of pulley, so you can mount it either direction. Here is the pulley and the required spacers for alternator clearance. Here is the pulley installed, the only issue I can see is that when using both required spacers the pulley only engages about an 1/8" of the alternator shaft(basically pulley face is at the threads of the shaft). The thickness of the pulley doesn't look, if at all, more than 1/8". I used this exact set-up on my 3G when I first installed it without any issues with the pulley. I ran it for about 3-4 months like this, I did change it out later when I had belt squealing issues when I pushed the amperage capabilities of the alternator. I modified my 460's crank pulley to accept a 6 rib sheave then re-installed the factory 3G 6 rib pulley to the alternator. If you can't find the right pulley, send what you have to me and I will put it in my lathe and make the nut recess you need. Sorry, just noticed Carl already offered. The bone yard had a Ranchero in it. I pulled that alternator to compare it to the 3G I found. With a little luck it will still be there waiting for me to snag the pulley. Thanks for the offer, Ribald............between you, Carl, and Todd. The pulley issue will be not be one if I strike out at the bone yard on Sunday.